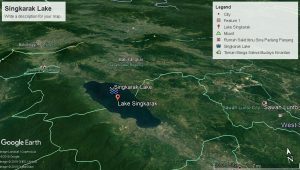 Lake Singkarak is one of the results of tectonic processes that are influenced by the Sumatra Fault. This lake is part of the Singkarak-Solok Basin which is included in the segment of the Sumatra Fault. The basin of the lake is formed from a subsidence caused by Sumatran fault activities. This large basin is blocked by volcanic material from the surrounding volcanic eruptions. As a result of damming this volcanic material Lake Maninjau was formed in one part of the Singkarak-Solok Basin. Unlike Lake Maninjau which was formed due to volcanic eruptions, Lake Singkarak was formed primarily due to tectonic processes. Research by experts reveals that 19 freshwater fish species live in the habitat of Lake Singkarak, including Fish Bilih (Mystacoleucus padangensis), a fish species that is estimated to only live on this lake, and is one of the typical foods. In addition there are also Bilih fish / Biko (Mystacoleusus padangensis Blkr), Asang / Nilem (Osteochilus brachmoides) and Rinuak. Other fish species that live in Lake Singkarak are Turiak / turiq (Cyclocheilichthys de Zwani), Lelan / Nillem (Osteochilis vittatus), Sasau / Barau (Hampala mocrolepidota) and Gariang / Tor (Tor tambroides). Then, Kapiek (Puntius shwanefeldi) and Balinka / Trunk (Puntius Belinka) species, Baung (Macrones planiceps), Kalang (Clarias batrachus), Jabuih / Buntal (Tetradon mappa), Kalai / Gurami (Osphronemus gurami lac) and Puyu / Betok (Anabas testudeneus).